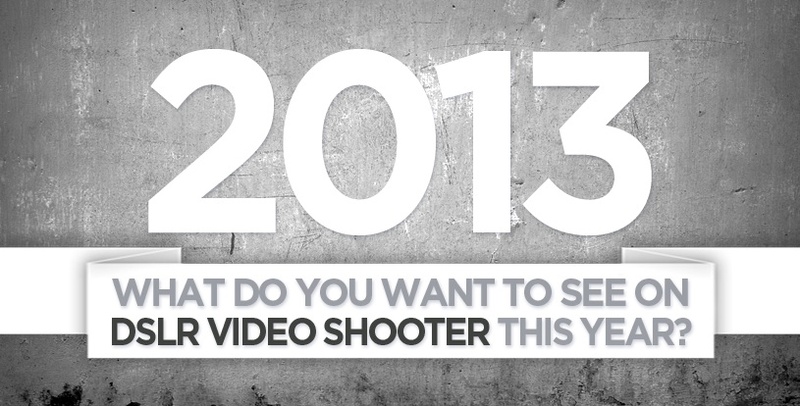 What Do YOU Want to See from DSLR Video Shooter this Year? Home ▸ Articles ▸ What Do YOU Want to See from DSLR Video Shooter this Year? 2013 is still fairly young, and I am starting to plan out this years content. I thought I would ask you guys what you’d like to see this year. Reviews? Tutorials? Articles? Interviews? Which do you value higher? Thanks! Heres to a great year! A workflow that includes Magic Lantern 2.3. How to properly configure it from top to bottom. Meaning, how to use the provided tools you get when you install it. Behind the Scenes. Reviews. Comparisons. Projects you want to make. While gear reviews and comparisons are nice, there are a ton of other review sites out there, often offering similar content. Personally, I’d love to see more behind-the-scenes videos, your own work, and perhaps some filming and post-production techniques, tips and tricks. Would love to see some comparisons showing high end products and their alternative, cheaper counterparts. There is so much gear I want to try but it’s so expensive and sometimes it’s hard finding a good alternative on the cheap! I love what you have been doing. Keep it up. I’m always a sucker for gear reviews. Ok, first here are a few topics I’d avoid – 1. Canon specific posts. There are TONS of other places to get that info. As a GH2 owner I’m not asking for coverage of my camera but please post stuff that we all can relate too. 2. No lens tests – tons of other places for that. (those tend to be Canon centric too) 3. No general gear news – that’s what NoFilmSchool is for. Here are a few things I’d like to see: 1. Posts on filters and how they can give modern lenses a vintage or filmic look (ex. Tiffen Black diffusion filters) 2. Ways to attach ND filters (ie. screw on vs matte box). 3. I’d like to see a video of you or your friends actually working on a project. Really helps to see how you rig your camera etc. and the issues that come up while filming. 4. A post discussing whether DSLR’s are really your best choice when starting out. As a noob I’ve spent more time trying to solve rigging issues, dual sound issues, stabilization issues, focusing issues (do I really need a follow focus?) etc. If I had to do it all over again I would have started out with a good camcorder with xlr inputs and just started filming stuff. It has ended up that I’ve spent way more time trying to make my camera suitable for shooting video than actually making video. Would be fun to see some your own work.